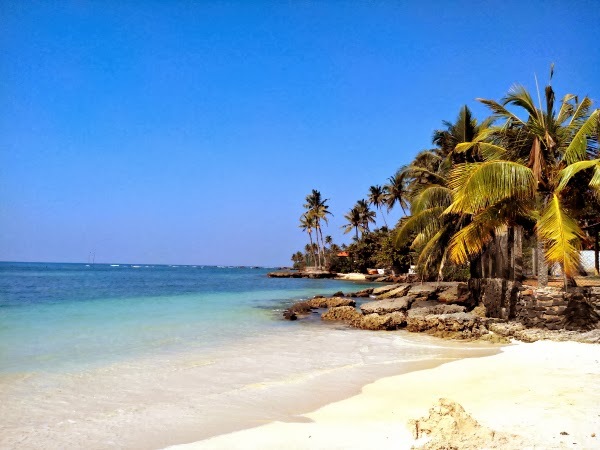 Srilanka is a charming country and the fact that you can spend a week here and not see a big dent in your account makes it one we really like. Though expenses would largely depend on how you spend the said week but we did everything from climbing the Adam's Peak to visiting the ruins of Sigiriya and spending a day strolling about the quaint hill towns. We couch surfed a few nights, stayed in hostels, mid range hotels and everything in between including our last night spent in the airport to catch our 2 pm flight back to India. We ate at the local shops where 100 rupees would feed both of us, we ate at one of those trendy places in Galle Fort and everything in between. We traveled on foot, took tuktuks, buses and trains to see the hills and the sea in the same day. 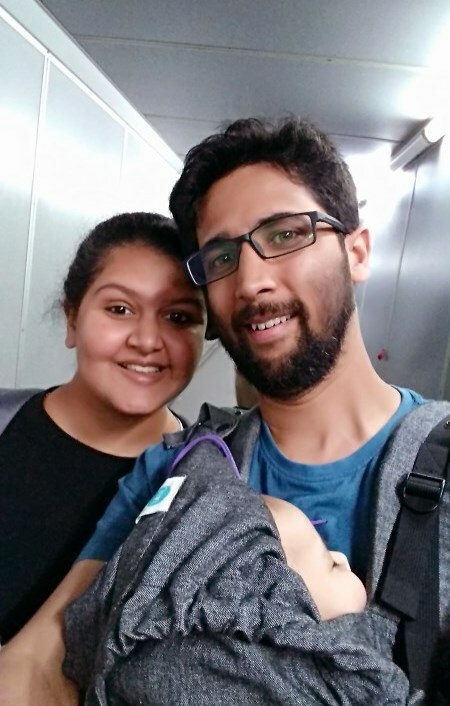 After doing (and loving) all of those we spent less than INR30000 for both of us including flights, convert that in $ and that is 500$ for two people spending 8 days in SriLanka. This post has been long overdue, but it did take me time to put it all together even if I had it all written. Also some of our friends will probably be hitting the country for their honeymoon, and a comprehensive post would do all of us good. We were there for around 8 days and certainly believe our per day cost would have gone lower if we were staying longer. For many, this is the biggest make or break expenditure and if you are flying in from anywhere other than South Asia or Middle East you will probably be jumping a few flights. We got a great deal on the tickets with Goibibo Promotion and we paid most of the remaining with our Citibank Premier miles. Flights are pretty cheap from Chennai and Madurai even if you book just a few weeks in advance. Srilankan Visa has to be the most convenient visa ever and it's even better than VOA because you don't have to stand in a single line or part with your passport. The procedure is simple fill up the form here and apply for your ETA which would follow soon after you pay. It took three minutes after payment and we had our ETA in our mails. The immigration officer did not even give me a second look or ask any question except for the reason I was in the country. Completely painless process and it makes me think of SriLanka anytime I have to plan a quick holiday. This can be the single biggest expense and totally depends on your comfort and taste. Simply put if you want to keep your expenses low, select clean and cheap accommodation. Here are the options which will help you keep your expenses low and get the most out of your money. Even we couldn't believe it but there are a lot of couchsurfing hosts especially near the major cities. We got a great host simply by asking around the forums and almost everyone I contacted was happy to host us. SriLankans are awesome and would be happy to help and show you around. Our host was around 15-20 minutes bus ride from Kandy and the views were amazing, though the room itself was quite modest. Don't forget to carry a token of appreciation for your host. We did not use Airbnb simply because we found other options before we reached Airbnb. Nevertheless there are increasingly more options available on Airbnb and our experience with Airbnb has been nothing but awesome. If you are not on Airbnb join with this link to get 25$ off your first booking. 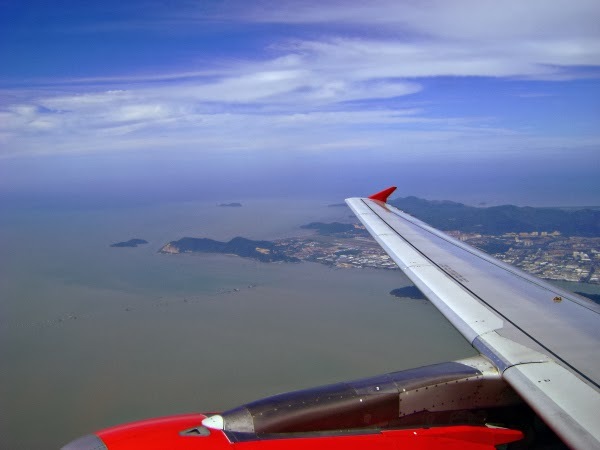 Important thing to remember is to contact your host before you book and make sure that your basic requirements are met and also get the location of the place especially if you are landing late in the night. Even though SriLanka has a lot of public transport and we have taken a bus at 2 in the night, it's better to be a bit safe as the streets get quiet after dark. There are more hotels than you can count especially in the touristy places and more often than not they are quite cheap. We walked in and shopped around for rooms at both Adam's peak (Nallathaniya) and Haputale. Both of these were quite comfortable cost us around 1000-1200(~10$) a night for a double room with hot shower without breakfast. Both of these were very conveniently located especially the one at Haputale. It was right next to the railway station. A location we were thankful for when we landed late in the night back form Ella and were greeted with chilling wind. You will easily get doubles with hot water for around 10-12 $ in the smaller towns and cities. Ask around and you will be directed to one of the hotels. We looked at more than 6 hotels, climbed up and down till one owner offered us a room for 1200 instead of 1800-2000 quoted by others. In bigger cities like Colombo and Kandy if you can find a host and are so inclined go the couch surfing way, other wise these cities would cost your around 20$ for a double room. You know I love these sites, be it Agoda, Booking.com or Hotels.com each one of those is a gift of it gods to the budget travelling community. We found our best and most expensive accommodation on Agoda, it cost us 1400 rupees (~12$) and it had the perfect social atmosphere. By the time we got to booking there were no more rooms available on Agoda so we just decided to contact them directly and got ourselves a room. Still Agoda was the first place we looked at and I am sure glad we did. Your first search for transport option will begin as soon as you get out of the airport, though there is a shuttle which takes you to the nearest bus stand we landed around 2 in the night and it wasn't running. Bus Stand itself is around a kilometer or so from the airport exit so we decided to walk and it was Ok except for Colombo heat and humidity. Srilanka is well connected and locals depend mainly on public transport to get from one city to another as well as for within the city. Being a small island (I am biased my home state is 5 times bigger than the country) you can easily cover a lot of land in 6-7 hours. We got from cold hills to warm beaches in less than 8 hours as we slept on the local bus. These are the life lines of Srilanka and you will find them everywhere. We asked an italian girl if she knew how we could go from Adam's Peak to Polhena beach, she wasn't sure but told us not to worry thee would definitely be a bus. Actually there was though not a direct one. As with any other country there are both standard public buses as well as air conditioned luxury buses. We chose the latter simply because weather was rarely very hot, they are quite clean and comfortable and also because they are cheap and abundant. Fare was around 150 for Colombo to Kandy thought the ride was nowhere near pleasant. Everyone stood plastered to at least 2-3 people, and the ones sitting had us standing people looming over them. In the hindsight i am just glad that there was a bus available at 2 in the night. Most buses we took were overloaded and surely it can be a bit uncomfortable if you are not used to it but we would still choose buses over hiring taxis any day. If you cannot find a direct bus ask around or use the map they give you at the airport and figure out a linking point. You will need these especially if you plan on visiting the east coast. In India we worship our trains without knowing it, they have always been there and almost every nook and corner is well connected. So imagine my surprise when I found that even though there is a good network of trains they do not connect all parts of the country. That being said trains are one of the best ways to get from one place to another in Sri lanka. Most of the newer and swanky trains run on the more popular routes like Galle-Colombo and Kandy-Colombo and the fare for a Air conditioned reserved seat is around 400 rupees and can vary depending on the train you take. Most of the hill side is connected with railways and it makes for an easy and beautiful journey. Many take train from Kandy to Ella simply for the ride. Once you combine buses and trains there is bound to be a way you can reach even the remotest areas. Getting Tickets can be a bit tricky especially if you want to travel first class or in any luxury class. Tickets are prebooked though the condition is not as bad as in India you should get a ticket a few days in advance. General and II class tickets are easily available and are quite cheap sometimes as less as 20 Rs. These are distributed 30 minutes before the train time and only at the stations. These auto rickshaws as they are called here in India have a big presence on the city roads and you might see a tuk-tuk with surfboards on the top running around in the south or west coast. thought these are far cheaper than hiring taxis they can be quite expensive and that money sure does add up fast. We took just on ride when we had to come from Kandy to our Host's house a bit late in the night. It cost us 400 LKR and if we had taken the bus it would have been around 40-60 depending on the bus. Haggle well if you are about to hire a tuk-tuk for sightseeing as the rates can go down quite a bit. We were quoted 3500 by the hotel guy in Haputale for a return trip to Horton National Park, when we asked around it came down to 2800 a 20% decrease in price. Well they exists and we saw a lot of hired vehicles on the road especially when we visited Sigiriya and Dambulla. We did not take one and seriously after tuk-tuk prices none of us was interested in even asking around for taxis. That being said it is always possible to ask hotel reception and they will probably hook you up. Want to ride through the country on a roaring motorbike or maybe drive around in a car, don't worry it is easily possible though it comes out to be a bit expensive with the rentals and petrol clubbed together. That is how we felt about it because we walk most places and take public transport, if you don't it might come in cheaper but will definitely blow up your budget. For starters getting your vehicle delivered to the airport will be around 30 $ which is around 3600 LKR or a full day's meal transport and stay. Food in Srilanka is cheap, real cheap though once it is clear that you don't belong here prices might just climb up. A guy overcharged us and when we pointed out he said that's how much it will be. He wouldn't serve beer because it was right outside the rock temple but he would cheat his way away. We faced less problems because most people thought we were locals but if you are not be prepared for some climbing prices (as per a french girl travelling solo). Now let's get back to food. Srilankans are eating almost all the time be it some tapioca chips, or boiled chickpeas or actual meal time. Which means you will find food fresh cheap and readily available all times of the day but as soon as it's 8-9 in the evening a lot of shops start closing especially if it is not a tourist area. Locals love their fish and if you like me don't eat fish you would find yourself asking every meal if this is vegetarian no egg no fish. If you are vegan or vegetarian it is better if you specify it clearly and always ask what all is in the sambal or red chilly paste served with everything. Some places add dried fish or prawn in it. This is one staple you would find throughout the country and at all meal times. Depending on where you eat and whether you are a vegetarian like me or a meat eater your meal would vary from 90 to 500 rupees. Our cheapest meal was at Polhena beach and most expensive at Ella. The home cooked meal in Ella was freshly prepared for us and was delicious. The lady was sweet and charged a fair price, we walked out feeling satisfied. People would ask me if I wanted to eat hoppers instead of whatever I had asked for and I had no clue what it meant. This meant a gentle smile and me walking out ion search of more kotthu. It was again at Polhen that we first tried hoppers and seriously I felt stupid these are just appams and I love appams. Definitely vegetarian and a hot tangy deliciousness that I ate too fast. We were served this with sambol but you might find these with fish curry or daal. Sting hoppers might sound like a cousin to hoppers but they are completely different. These are rice noodles flattened into a cake and are served with thin fish or chicken curry, daal and sambol. Fruit is everywhere especially banana, we ate over 12 bananas in a day once. With these small sweet treats it is pretty easy to eat that much on your own. Coconut water and coconut are easily available everywhere (except for the hills I guess) and so are other fruits. 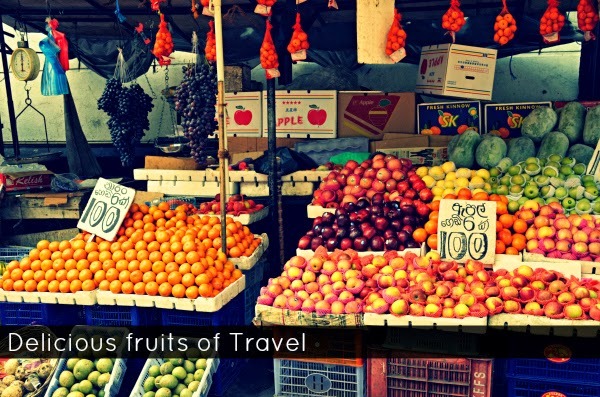 We walked around Kandy central market one day and our senses were overcome by all the fruit on display though soon the fish took over. Wood apple is another one of the fruits you will find in abundance and it makes for a really nutritious and refreshing drink. I don't even have to write about it because everywhere you go you will find fish even high up on the hills. Maldivian tuna is one of the biggest favorites in the country and it is everywhere from your dishes to the sambol. Most of the traditional meals come with atleast one serving of fish unless you ask especially for something else. On the shores prawns, calamari gain big grounds and we saw people cleaning plates after plates of spicy sea food curries. No clue how much the big guys would charge you but locally run shops and restaurants would probably cost you around 200-300 for a good filling meal. If you do eat fish don't forget to try the famous fish ambul thiyal a sour fish curry served with rice and other curries. Lion is the local beer of the country and is widely available. Though we did see a few other beers mentioned here and there, this is the one we were interested in. A 650ml bottle would cost you around 220 and you would get 20 bucks back when you return the glass bottle. Wine/beer shops are abundant and all you have to do is walk around or ask the shop keepers. If you are looking for swanky bars head over to Dutch hospital in Colombo it is a great place to eat drink shop and simply sit. Srilanka has a lot for you to do see and experience, no matter which part of the country you are in and how much you have in your pocket. Srilanka has eight world heritage sites and each one of them has something completely different to offer than the next. We visited five of these during our week long stay and it was fun. Go on and read in detail about these sites, how to get there and everything else here. Entry to most of these sites is really expensive, for example Sigiriya would cost your around 3300-3400 LKR in entry ticket. If you have a SAARC passport you will get 50% off prices except for at the Rock Temple Dambulla. Many travellers we met had given up on site or another because of the cost. We gave up Horton Plains because ticket was 3300 per person and tuk tuk ride was equally expensive. India is not know for it's surfing, the reason surfing is in its infancy here. So imagine my delight when I caught sun tanned people catching waves, roaming around with surfboards and a couple with HUGE surfboards at the airport. I was so happy and I did not even see them up close. If you love the waves or if you like me, have never gone close to one SriLanka is the place for you. Head over to Aurugam Bay on the East coast for awesome waves and surfing crowd or just stay close by on the west coast and you'll still not be short of company or waves. There are multiple surf camps in SriLanka none which would fit the 30$ budget and you can easily rent a board on the beach from 250-300LKR upwards in Weligama. Shop around for board rentals as well as trainers if you are just getting started. 5500 steps to reach the summit would be difficult any day but do it in the night and it gets even more challenging. A part of the Peak Wilderness protected area this mountain is a place of worship for four religions. Even if the climb seems tiresome you will forget all about your aching feet when you get to the top and see the awesome view. One advice carry warm clothes you can get in and out of with ease, it is chilling on the top but the climb will have you sweating. Climbing the peak is free and one of the things on my 5 free things to do in Srilanka list. Before we were about to go to SriLanka we were in a moral bind, because of the human right crisis in the country. We thought about it and put it out for discussion on the internet. This one line stayed with me more than anything else"... no matter what it's not fair to keep your business away from a poor war torn population". This changed the way I thought about things, yes a lot of what I would spend would land in wrong hands but along the way I would have helped a lot of people simply by buying a small pack of peanuts for 20 LKR. If you have the same thoughts or are a bit skeptical don't be, it is a safe country with welcoming people who would love to host you. A very comprehensive and lovely post. Such a helpful post! Thanks.